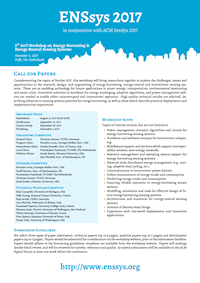 Complementing the topics of ACM SenSys 2017, this workshop will bring researchers together to explore the challenges, issues and opportunities in the research, design, and engineering of energy-harvesting, energy-neutral and intermittent sensing systems. These are an enabling technology for future applications in smart energy, transportation, environmental monitoring and smart cities. Innovative solutions in hardware for energy scavenging, adaptive algorithms, and power management policies are needed to enable either uninterrupted and intermittent operation. This page was last updated on 26th May 2017; has been validated as HTML 4.0 Transitional and CSS level 2.1 and tested with Internet Explorer, Firefox, Safari, Chrome and Opera.